Lye Soap is a misnomer. The recipe for soap is Water plus Lye makes a liquid that is added to oil. The chemical reaction is called Saponification. Saponification converts the Oil (fat) to Soap. No Lye should remain once the soap is cured. Water + Lye + Fat = Soap. First off, no, I am not talking Melt and Pour. That process is where you buy a big block of soap base, slice it down, melt it in a pot, add colors and scents, and pour into a mold. May as well buy it at the store. This is the actual "chemistry" side of things. If you are good at Chemistry, Baking, Measuring precisely, you probably can do this. There is always a warning about Lye, and a disclaimer. By using this information, you acknowledge that your are voluntarily agreeing to not hold Ramblingmoose, and all people within free of any responsibilities and liabilities due to damage, injury, loss of bodily function or death. This is to be interpreted in the broadest possible terms. Wild huh? Needs to be. And it is by no means complete. Both the disclaimer and these notes. Do your research. Lye, in the strengths you will be using, is a highly caustic chemical. Lye can burn, and the fumes that result from the chemical reactions between Lye and Water, and the mixture of Lye and Water when added to oils and fats can be toxic. When I mixed my Lye and Water, I used plastic containers, plastic utensils, and did it outdoors. Some people say that you can do this indoors, I say no. Mix your Lye by adding Lye to Water, and never the other way around. Do so slowly and outdoors, even if you have a really great stove hood that is vented outside. Use plastic or stainless steel to mix Lye. The chemical gasses that are given off are poisonous when you add Lye to Water. All products are caustic until at least partial curing happens. Keep White Vinegar nearby to neutralize anything then flush with a lot of water. On the other hand, you probably can make this. Furthermore, Always use 100% Lye. You can buy Food Grade Lye online for Soap Making and Baking. Never use the drain cleaner from under the sink - it has probably aluminum in it and you don't want. You can use drain cleaner only if it is CLEARLY labeled 100% Lye. Remember only use 100% Lye. It comes in granules like grains of sand or flakes. I found mine at an old school hardware store and it says that it is a drain cleaner. Third - your choice of oils. This started because we found a very large bottle of rather high grade olive oil. It did not smell "off" but it was past the sell by date by a year and a half. Being thrifty I remembered that Castile Soap was made from Olive Oil, Lye, and Water. I began to look for videos on Youtube for them and frankly there are so many soap recipes there that I won't bother including one. A Three Ingredient Soap Recipe will make a great product. Olive Oil, Lye, Water = Castile Soap. You know, the stuff you pay five dollars minimum a bar at a posh market? How does $.75 a bar sound? Or less if you are using leftover oils like I am. But I am writing this to remind myself in a couple months how I did this the first time and how to tweak things at that point. And soaps cure at different speeds. While pure Castile soap takes 4 to 6 MONTHS to fully cure, others take 4 to 6 WEEKS to cure. I am expecting what I made this first time to be "weeks rather than months" and will check in six weeks by using it in the shower. Then I went to the cupboard and discovered that I had some Cold Pressed Sesame Oil, and some Coconut Oil both of which were out of date. I bought some Shea Nut Tree Oil for the project since I wanted a softer soap that would help with dry hands, and added that to my selection. What I am getting at is that if it is a natural oil, it can probably be used to make soap. Every single oil out there has their own chemical profile. Some are silky soft like the Shea Butter and Shea Nut Oil. Others build a firm soap to counteract the softer shea butter - like Coconut Oil. The chemical profiles will change the way your soap will react with your skin. If you have sensitive skin, consider adding oils that are commonly used in hand creams like Aloe, Shea Nut, and Jojoba. Furthermore, all this fiddly stuff is basically an Algebra Equation. That means that someone has already written a calculator that will tell you how much Water and Lye mixture you shall add to your oils. You enter in your quantity of oils in ounces or grams, and tell the calculator that you want to have a solid or a liquid soap, and it spits out a recipe. Easy huh? Fragrance Essential Oils would be added, I used 1/2 Ounce or 14 grams of Rosemary Essence Oil. While this is a "Cold Process Soap Recipe", technically it is not a "Castile" soap because there is no Olive oil in it. Won't matter, I'm looking for something for sensitive skin first time out. It made for a small batch of five smallish soap bars. It is curing and will remain curing for six weeks to harden. After four days, it is noticeably more firm than it was on day 2. Everything used should be either Plastic or Stainless Steel. Silicone can be used for molds. Parchment Paper worked best to line the molds. Individual soap bars can be made in a loaf in a silicone bread pan, then sliced on day 2 by using a dough cutter that is typically stiff plastic or stainless steel. Silicone individual soap bar molds are available. Plastic handled Silicone Tipped Spatula to scrape the soap out of the mixing bowl. Disposable container to mix Lye into Water (in that order). Measuring cups - glass or plastic. Electrically powered stick mixer is pretty much a requirement. You should take a trip to the kitchen and see what you can "sacrifice" to Soap Making. You really don't want your soap supplies to mix with your cooking supplies since you will never get all that residue off of things. 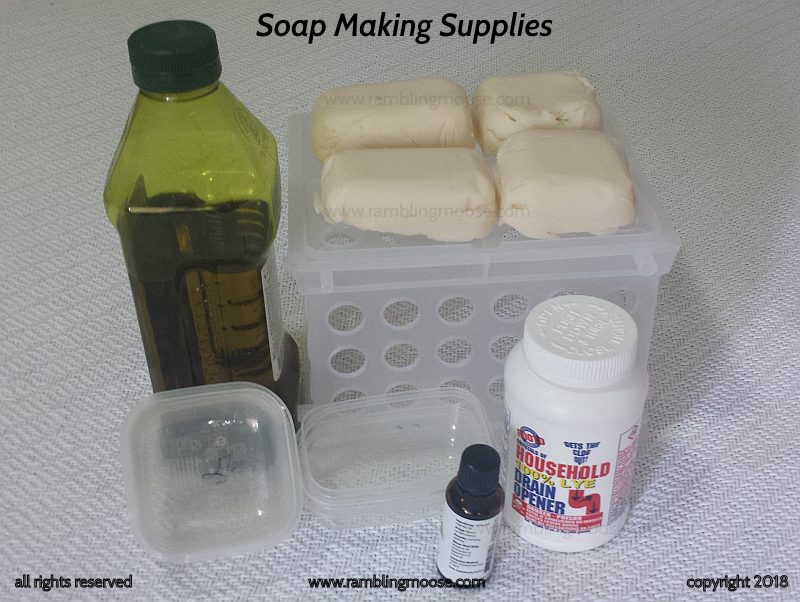 Take a Sharpie or Paint and write "Soap" on these supplies. No, really, keep things separate. Then go to the local thrift store, then the dollar store, then perhaps a Kitchen supply house in that order. Because of price. I got my 4 Quart (3.8 Liter) stainless steel Farberware pot for $4, and a Stick Mixer for $6. Also found silicone spatulas and plastic mixing spoons for $.50 each. Soap Molds? They were there for $.25 each. Measuring Cup was a Dollar. I made do with some old plastic Cottage Cheese containers for mixing Lye into Water. It got recycled anyway! The Thrift Stores are your friend. The Dollar Stores sometimes also have Cocoa Butter and Shea Butter, but make sure that they are Pure and have nothing else listed in the ingredients. I got my Lye at an Ace Hardware at 5.38 a pound. 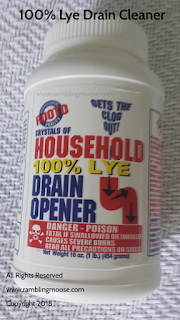 It was clearly listed as 100% Lye, and was sold as Drain Cleaner. White Vinegar for neutralizing any Lye, or Water/Lye, or Soap mix that gets on your hands. All products are caustic until at least partial curing happens. Finally Beauty Supply houses may be helpful. Of course there is always online. The Lye Calculator has affiliate links so that they can pay for that wonderful Lye Calculator page that they wrote. Fifth - How I made my first batch. I gathered all my gear together in the kitchen. Measured out my Ice Water - the water should be as cold as possible without any chunks of ice. I set the water in a plastic cottage cheese container inside my stainless steel mixing pot, then surrounded the cottage cheese container with ice. The reason for all this cold water is that Lye reacts with water to create Heat, Noxious Poisonous Fumes, and the Water and Lye that you need to add to your oils. The colder you have the water, the better. It will become hot to the touch and you need the Water/Lye mix to be close to the same temperature as your Oils when you go to mix your soap. Mix your Oils - All my oils were liquid. Knowing that the Water/Lye mix was going to be hot, I heated my oils to 120F or about 50C. Approximately. My house is warm enough to keep Virgin Coconut Oil soft or even liquid in the winter months - this is South Florida after all. I placed the oils in a plastic cottage cheese holding container and set aside. Weighing out the precise amount of Lye, I walked it outside where I had previously set the ice water. It was on a table next to my garden hose in case it splashed. More importantly, a gallon of White Vinegar was sitting next to the table in case of emergency. White Vinegar will neutralize Lye better than Water. Getting a plastic teaspoon in one hand, I began to SLOWLY pour the lye into the ice water and stir it as I mixed things. As it mixed, the water clouded up, and there was a production of gasses. I continued slowly adding lye to the now warming water in the cup in the middle of the ice bath while stirring and making certain not to breath in the fumes. Luckily I had a very light breeze that way off the ocean blowing the fumes off. Once the Water/Lye mix was complete, I left it there to cool. Removing it from the ice bath when it got roughly room temperature, I dumped out the ice water and dried out my pot thoroughly. Next, I added the Oils Mixture to the mixing pot. Adding the Water/Lye mixture to the Oils Mixture is done slowly. Using the long plastic mixing spoon I had, I poured the lye into the Oils seeing an immediate clouding of the oils signifying the beginning of the Saponification Reaction that converts fats, water and lye into soap. I was told that I could get the soap to change into a stiff pudding consistency in about 45 minutes max. That was wrong. I made the mistake of stirring this by hand for 50 minutes. I saw a very slight thickening from a watery oil to a semi thick motor oil consistency. I could have poured this all into molds and stopped however I had more to do. 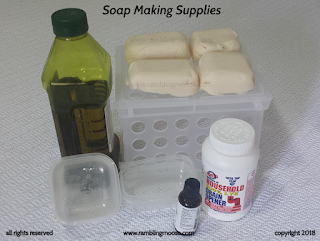 Liquid Castile Soap made with the right recipe will firm up in a day if placed in the mold in the right conditions. At this point I added in the one half ounce of Rosemary Essence and stirred this by hand before using the stick blender. It was still quite liquid. Then I brought it into the kitchen and mixed it with pulses from the Stick Blender. It immediately thickened into something that looked like soft peaks in a meringue, or a not completely set pudding. Next time I make soap, I will stir with the big plastic spoon for "A Couple Minutes" (arbitrary amount of time) then immediately come in and use the stick blender. There's a reason why electric tools are made! Finally I scooped the soap into the molds that were lined with Baker's Parchment Paper. One was lined with plastic wrap and a third was unlined. Stick with the Parchment Paper, it was absolutely the easiest to remove the bars from the molds. Once removed from the molds, I placed the soap into a large cardboard box to cure. Covering the soap with a towel helps to keep the curing bars from getting dusty. Curing takes between 4 and 6 weeks. It allows the Saponification Reaction to finish converting the fats in the oil and the Lye to Soap. The longer you allow it to cure the less caustic the soap will be. Be Patient. A longer Cure is better than a shorter one. Now I wait. Some time around May 2, my soap will be ready to use. Watching all those videos put a scare in to me that I am glad I had. Adding Lye to Water I got a sniff of the fumes they were talking about. Dilute and a small accidental sniff, it was an evil acrid, smell. Like I said, add Lye to Water and do so outdoors. When I de-molded the soap, it left a little on the outside of the mold. By the time I got around to cleaning the molds, the soap was strong but I was able to get a first "test". Not bad. The Shea Butter helped to leave my hands silky smooth. Looking forward to May to try this out safely.